LubyTreeServiceBlogTree ServiceWhy Is Pruning considered very important? So, it is advised that you leave the task of tree pruning on an expert such as Luby tree service as they are into the following business for many years. It is highly recommended as it can provide you the personal safety as well as keep you relaxed. Tree structure and growth :- There are a lot of reasons that will make you sure that tree pruning is quite important. It can certainly cause a lot of impact in the way the tree will grow. With the use of proper technique, a tree can ideally grow in a certain manner of branches and limps so that the structure of the tree is maintained. If you maintain the tree on the regular basis, then the risk of falling branches and broken limbs would be a lot reduced. In addition, it won’t have any uneven distribution of weight and hence you can save any kind of disaster that may occur in the life cycle of a tree. Besides this, the look of the tree can also be improved with the help of structural pruning. It can help the tree to grow in a proper manner. When should you prune the trees? In general, the pruning of the tree should be done in the late winter or fall primarily in the dormant season. The major reason behind this is during the course of this period the tree is less likely to be harmed due to pruning. Stress can also occur in trees and thus the removal of branches can cause significant damage. In the condition when the tree is dormant, then the fungus and insects are less likely to cause any kind of damage. Moreover, less sap would be lost if the tree is damaged. Different kind of trees might need different approaches for pruning as well as the timing. It is recommended that you get in touch with a tree pruning contractor such that the safety of the tree, as well as our own safety, could be improved. Make sure not a lot of pruning is done :- One thing that you should make sure is not to prune the tree much. 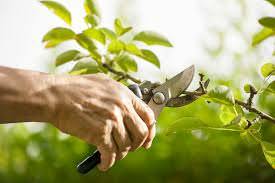 You should prune only that much amount that can give you the desired results. Not more than ¼ of the crown should be pruned as this is the only place where most of the leaves are present and probably gets the most of the energy. If you prune the tree a lot, then you are most likely to damage a lot of trees. So, get in touch with us and we will give you the perfect solution to keep your tree in good shape.